Last week, Altria Group Inc. released a report of the 2018 second-quarter and first-half business results, whilst tightening its guidance for the 2018 full-year adjusted diluted earnings per share. Altria Group, Inc. (Altria) MO, +0.31% today announced its 2018 second-quarter and first-half business results and tightened its guidance for 2018 full-year adjusted diluted earnings per share (EPS). As previously announced, a conference call with the investment community and news media will be webcast on July 26, 2018 at 9:00 a.m. Eastern Time. Access to the webcast is available at www.altria.com/webcasts and via the Altria Investor app. “Adjusted” financial measures presented in this release exclude the impact of special items.See “Basis of Presentation” for more information. Altria paid over $1.3 billion in dividends in the second quarter. Altria’s current annualized dividend rate is $2.80 per share, representing an annualized dividend yield of 4.9% as of July 20, 2018. Altria repurchased 7.6 million shares in the second quarter at an average price of $57.65, for a cost of approximately $437 million. In May 2018, the Board authorized a $1 billion expansion to the previous $1 billion share repurchase program. As of June 30, 2018, Altria had slightly more than $1 billion remaining in the current $2 billion share repurchase program, which Altria expects to complete by the end of the second quarter of 2019. The timing of share repurchases depends upon marketplace conditions and other factors, and this program remains subject to the discretion of the Board. 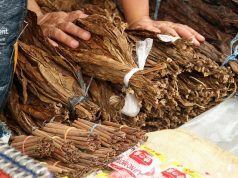 In May, Altria announced a new corporate structure to accelerate its innovation pipeline and maximize its core tobacco businesses. USSTC submitted premarket tobacco product applications to the U.S. Food and Drug Administration (FDA) for VERVE Discs and VERVE Chews. Nu Mark grew e-vapor volume by approximately 16% in the quarter, reflecting its expansion of MarkTen Elite to over 23,000 retail stores. PM USA’s initial lead market plans for IQOS are ready to deploy upon FDA authorization. In July, Altria submitted its comments for the three advance notices of proposed rulemaking (ANPRM) that were published by the FDA in the first quarter. The comments are available at www.altria.com. Altria tightens its guidance for 2018 full-year adjusted diluted EPS to be in a range of $3.94 to $4.03, representing a growth rate of 16% to 19% from an adjusted diluted EPS base of $3.39 in 2017 as shown in Schedule 10. This guidance range excludes the special items for the first half of 2018 shown in Table 1 and an additional $0.05 of tax expense resulting from the Tax Cuts and Jobs Act (Tax Reform Act) expected in the second half of 2018. This tax expense is related to a tax basis adjustment to Altria’s AB InBev investment. Altria’s 2018 guidance reflects investments in focus areas for long-term growth, including innovative product development and launches, regulatory science, brand equity, retail fixtures and future retail concepts. Altria expects its 2018 full-year adjusted effective tax rate will be in a range of approximately 23% to 24%. Altria’s full-year adjusted diluted EPS guidance and full-year forecast for its adjusted effective tax rate exclude the impact of certain income and expense items that management believes are not part of underlying operations. These items may include, for example, loss on early extinguishment of debt, restructuring charges, gain/loss on AB InBev/SABMiller business combination, AB InBev special items, certain tax items, charges associated with tobacco and health litigation items, and resolutions of certain non-participating manufacturer (NPM) adjustment disputes under the Master Settlement Agreement (such dispute resolutions are referred to as NPM Adjustment Items). See “Basis of Presentation” for an explanation of financial measures and reporting segments discussed in this release. Altria uses the equity method of accounting for its investment in AB InBev and reports its share of AB InBev’s results using a one-quarter lag. Net revenues declined 5.4% to $6.3 billion, primarily due to lower net revenues in the smokeable products segment. Revenues net of excise taxes declined 3.7% to approximately $4.9 billion. Reported diluted EPS decreased 3.9% to $0.99, primarily driven by the 2017 gain on the AB InBev/SABMiller business combination, higher investment spending in the innovative tobacco products businesses and lower reported operating companies income (OCI) in the smokeable products segment. These results were partially offset by lower income taxes, higher reported equity earnings from AB InBev (which included AB InBev special items), fewer shares outstanding and higher reported OCI in the smokeless products segment. Adjusted diluted EPSincreased 18.8% to $1.01, primarily driven by lower income taxes and fewer shares outstanding, partially offset by lower adjusted OCI in the smokeable products segment and higher investment spending in the innovative tobacco products businesses. Net revenues declined 2.6% to $12.4 billion, as lower net revenues in the smokeable products segment were partially offset by higher net revenues in the smokeless products segment. Revenues net of excise taxes declined 1.1% to approximately $9.5 billion. Reported diluted EPS increased 13.7% to $1.99, primarily driven by lower income taxes, higher reported equity earnings from AB InBev (which included AB InBev special items), fewer shares outstanding and higher reported OCI in the smokeless products segment. These results were partially offset by the 2017 gain on the AB InBev/SABMiller business combination, higher investment spending in the innovative tobacco products businesses and lower reported OCI in the smokeable products segment. Adjusted diluted EPSincreased 24.1% to $1.96, primarily driven by lower income taxes, higher adjusted equity earnings from AB InBev, fewer shares outstanding and higher adjusted OCI in the smokeless products segment, partially offset by lower adjusted OCI in the smokeable products segment and higher investment spending in the innovative tobacco products businesses. 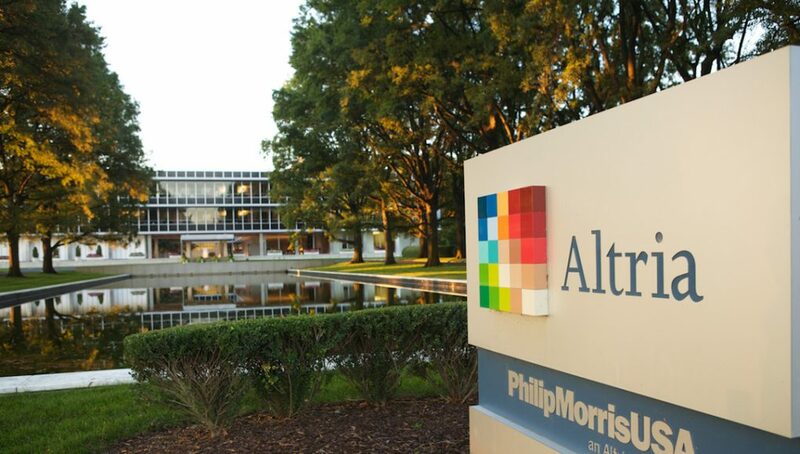 In the second quarter of 2018, Altria recorded pre-tax income of $77 million (or $0.03 per share) for an NPM adjustment settlement with Pennsylvania. In the first half of 2018, Altria recorded pre-tax income of $145 million (or $0.06 per share) for NPM adjustment settlements with ten states. In the second quarter and first half of 2018, Altria recorded pre-tax charges of $70 million (or $0.03 per share) and $98 million (or $0.04 per share), respectively, for tobacco and health litigation items and related interest costs. In the second quarter of 2018, equity earnings from AB InBev included net pre-tax income of $72 million (or $0.03 per share), consisting primarily of gains related to AB InBev’s merger and acquisition activities, partially offset by Altria’s share of AB InBev’s mark-to-market losses on AB InBev’s derivative financial instruments used to hedge certain share commitments. In the first half of 2018, equity earnings from AB InBev included net pre-tax income of $189 million (or $0.07 per share), consisting primarily of Altria’s share of AB InBev’s estimated effect of the Tax Reform Act, and gains related to AB InBev’s merger and acquisition activities, partially offset by Altria’s share of AB InBev’s mark-to-market losses on AB InBev’s derivative financial instruments used to hedge certain share commitments. In the first half of 2017, equity earnings from AB InBev included net pre-tax charges of $75 million (or $0.03 per share), consisting primarily of Altria’s share of AB InBev’s mark-to-market losses on AB InBev’s derivative financial instruments used to hedge certain share commitments. In the first half of 2018, Altria recorded a pre-tax loss of $33 million (or $0.01 per share) related to AB InBev’s divestitures of certain SABMiller assets and businesses in connection with the AB InBev/SABMiller business combination. In the second quarter and first half of 2017, Altria recorded a pre-tax gain of $408 million (or $0.14 per share) related to AB InBev’s divestitures of certain SABMiller assets and businesses in connection with the AB InBev/SABMiller business combination. In the second quarter and first half of 2018, Altria recorded income tax charges of approximately $95 million (or $0.05 per share) primarily related to a tax basis adjustment to Altria’s AB InBev investment and for a valuation allowance on foreign tax credit carryforwards that are not realizable. In the second quarter and first half of 2017, Altria recorded income tax benefits of $108 million (or $0.06 per share) and $166 million (or $0.09 per share), respectively, primarily related to the effective settlement of the 2010-2013 Internal Revenue Service audit. Net revenues declined 6.3%, as lower volume was partially offset by higher pricing and lower promotional investments. Revenues net of excise taxes declined 4.8%. Reported OCI declined 1.0%, as lower volume and higher tobacco and health litigation items were partially offset by higher pricing, lower promotional investments and NPM Adjustment Items. Adjusted OCI declined 2.8%, primarily driven by lower volume, partially offset by higher pricing and lower promotional investments. Adjusted OCI marginsincreased 1.1 percentage points to 52.6%. Net revenues declined 3.7%, as lower volume was partially offset by higher pricing and lower promotional investments. Revenues net of excise taxes declined 2.3%. Reported OCI declined 0.5%, as lower volume, higher costs (including higher tobacco and health litigation items and investments in strategic initiatives) and higher resolution expenses were partially offset by higher pricing, higher NPM Adjustment Items and lower promotional investments. Adjusted OCI declined 2.4%, primarily driven by lower volume, higher costs (including investments in strategic initiatives) and higher resolution expenses, partially offset by higher pricing and lower promotional investments. Adjusted OCI margins were unchanged at 51.2%. Adjusted OCI margins are calculated as adjusted OCI divided by revenues net of excise taxes. Smokeable products segment reported domestic cigarette shipment volumedeclined 10.8%, primarily driven by trade inventory movements, the industry’s rate of decline and retail share losses. When adjusted for trade inventory movements, smokeable products segment domestic cigarette shipment volume decreased by an estimated 5%. Total domestic cigarette industry volumes declined by an estimated 3.5%. Reported cigarshipment volume increased 2.7%. Smokeable products segment reported domestic cigarette shipment volumedeclined 7.6%, primarily driven by the industry’s rate of decline, trade inventory movements and retail share losses. When adjusted for trade inventory movements, smokeable products segment domestic cigarette shipment volume decreased by an estimated 5.5%. Reported cigarshipment volume increased 2.8%. Marlboro retail share declined 0.3 share points to 43.2%. Marlboro retail share was stable sequentially from the first quarter. Smokeable products segment total cigarette retail share declined 0.7 share points to 50.2%, and declined 0.1 share point sequentially. Nat Sherman expanded Nat’s into 13 additional states across the western U.S. in mid-June. Marlboro retail share declined 0.4 share points to 43.2%, driven in part by continued effects from the April 2017 California state excise tax increase. Smokeable products segment total cigarette retail share declined 0.8 share points to 50.2%. Net revenues increased 2.7%, primarily driven by higher pricing partially offset by lower volume. Revenues net of excise taxes increased 2.8%. Reported OCI increased 8.6%, primarily driven by higher pricing and lower asset impairment, exit and implementation costs, partially offset by lower volume. Adjusted OCI increased 3.5%, primarily driven by higher pricing partially offset by lower volume. Adjusted OCI margins increased 0.5 percentage points to 69.9%. Net revenues increased 7.2%, primarily driven by higher pricing and the impact of the 2017 voluntary recall, partially offset by lower volume. Revenues net of excise taxes increased 7.5%. Reported OCI increased 20.6%, primarily driven by higher pricing, the impact of the 2017 voluntary recall and lower asset impairment, exit and implementation costs, partially offset by lower volume. Adjusted OCI increased 13.5%, primarily driven by higher pricing and the impact of the 2017 voluntary recall, partially offset by lower volume. Adjusted OCI margins increased 3.8 percentage points to 69.5%. Smokeless products segment reported domestic shipment volume declined 2.4% primarily driven by the industry’s rate of decline and retail share losses. Adjusted shipment volume comparisons are not provided due to the unusual effects of the 2017 recall. Smokeless products segment reported domestic shipment volume declined 1.3% primarily driven by the industry’s rate of decline. When adjusted for calendar differences, the smokeless products segment shipment volume declined approximately 1.5%. The smokeless industry volume declined an estimated 1% over the past six months. Copenhagen retail sharewas unchanged at 34.3% and Skoal retail share declined 0.4 share points to 16.4%. Copenhagen and Skoal combined retail share decreased 0.4 share points to 50.7%. Smokeless products segment total retail share declined 0.2 share points to 54.1%. Copenhagen retail sharegrew 0.5 share points to 34.3% and Skoal retail share declined 0.7 share points to 16.3%. Copenhagen and Skoal combined retail share decreased 0.2 share points to 50.6%. Smokeless products segment total retail share was unchanged at 54.0%. Note: Retail share results for smokeless products are based on data from IRI InfoScan, a tracking service that uses a sample of stores to project market share and depict share trends. This service tracks sales in the food, drug, mass merchandisers, convenience, military, dollar store and club trade classes on the number of cans and packs sold.Smokeless products is defined by IRI as moist smokeless and spit-free tobacco products.New types of smokeless products, as well as new packaging configurations of existing smokeless products, may or may not be equivalent to existing MST products on a can-for-can basis. For example, one pack of snus, irrespective of the number of pouches in the pack, is assumed to be equivalent to one can of MST. Because this service represents retail share performance only in key trade channels, it should not be considered a precise measurement of actual retail share. It is IRI’s standard practice to periodically refresh its InfoScan services, which could restate retail share results that were previously released in this service. Net revenues increased 10.7%, primarily driven by favorable mix and higher shipment volume. Reported and adjusted OCI increased 8.0%, primarily driven by higher volume and favorable mix, partially offset by increased costs. Reported wine shipment volume grew 6.3% to approximately 1.9 million cases. Net revenues increased 6.2%, primarily driven by higher shipment volume. Reported and adjusted OCI declined 4.3%, primarily driven by higher costs, including one-time employee bonuses, partially offset by higher shipment volume. Reported wine shipment volume grew 6.2% to approximately 3.7 million cases. OCI margins are calculated as OCI divided by revenues net of excise taxes. Altria’s wholly-owned subsidiaries include Philip Morris USA Inc. (PM USA), U.S. Smokeless Tobacco Company LLC (USSTC), John Middleton Co. (Middleton), Sherman Group Holdings, LLC and its subsidiaries (Nat Sherman), Nu Mark LLC (Nu Mark), Ste. Michelle Wine Estates Ltd. (Ste. Michelle) and Philip Morris Capital Corporation (PMCC). Altria holds an equity investment in Anheuser-Busch InBev SA/NV (AB InBev). The brand portfolios of Altria’s tobacco operating companies include Marlboro [®] , Black & Mild [®] , Copenhagen [®] , Skoal [®] , VERVE [®] , MarkTen [®] and Green Smoke [®] . Ste. Michelle produces and markets premium wines sold under various labels, including Chateau Ste. Michelle [®] , Columbia Crest [®] , 14 Hands [®] and Stag’s Leap Wine Cellars [™] , and it imports and markets Antinori [®] , Champagne Nicolas Feuillatte [™] , Torres [®] and Villa Maria Estate [™] products in the United States. Trademarks and service marks related to Altria referenced in this release are the property of Altria or its subsidiaries or are used with permission. More information about Altria is available at altria.com and on the Altria Investor app. Altria reports its financial results in accordance with GAAP. Altria’s management reviews OCI, which is defined as operating income before general corporate expenses and amortization of intangibles, to evaluate the performance of, and allocate resources to, the segments. Altria’s management also reviews OCI, OCI margins and diluted EPS on an adjusted basis, which excludes certain income and expense items, including those items noted under “2018 Full-Year Guidance.” Altria’s management does not view any of these special items to be part of Altria’s underlying results as they may be highly variable, may be infrequent, are difficult to predict and can distort underlying business trends and results. Altria’s management also reviews income tax rates on an adjusted basis. Altria’s adjusted effective tax rate may exclude certain tax items from its reported effective tax rate. Altria’s management believes that adjusted financial measures provide useful additional insight into underlying business trends and results and provide a more meaningful comparison of year-over-year results. Altria’s management uses adjusted financial measures for planning, forecasting and evaluating business and financial performance, including allocating resources and evaluating results relative to employee compensation targets. These adjusted financial measures are not consistent with GAAP and may not be calculated the same as similarly titled measures used by other companies. These adjusted financial measures should thus be considered as supplemental in nature and not considered in isolation or as a substitute for the related financial information prepared in accordance with GAAP. Reconciliations of historical adjusted financial measures to corresponding GAAP measures are provided in this release. Altria uses the equity method of accounting for its investment in AB InBev and reports its share of AB InBev’s results using a one-quarter lag because AB InBev’s results are not available in time to record them in the concurrent period. The one-quarter reporting lag does not affect Altria’s cash flows. Important factors that may cause actual results and outcomes to differ materially from those contained in the projections and forward-looking statements included in this press release are described in Altria’s publicly filed reports, including its Annual Report on Form 10-K for the year ended December 31, 2017 and its Quarterly Report on Form 10-Q for the period ended March 31, 2018. These factors include the following: significant competition; changes in adult consumer preferences and demand for Altria’s operating companies’ products; fluctuations in raw material availability, quality and price; reliance on key facilities and suppliers; reliance on critical information systems, many of which are managed by third-party service providers; fluctuations in levels of customer inventories; the effects of global, national and local economic and market conditions; changes to income tax laws; federal, state and local legislative activity, including actual and potential federal and state excise tax increases; increasing marketing and regulatory restrictions; the effects of price increases related to excise tax increases and concluded tobacco litigation settlements, consumption rates and consumer preferences within price segments; health concerns relating to the use of tobacco products and exposure to environmental tobacco smoke; privately imposed smoking restrictions; and, from time to time, governmental investigations. Cost of sales includes charges for resolution expenses related to state settlement agreements and FDA user fees. Supplemental information concerning those items and excise taxes on products sold is shown in Schedule 5. Net Earnings and Diluted Earnings Per Share – Attributable to Altria Group, Inc.